For white citizens, New Year’s Day in Augusta, Georgia is filled with hope for the coming months. Augusta, a large and important city in the state, is also the birthplace of the Southern Baptist Convention. The SBC had been founded in 1845 in the city’s First Baptist Church, at a south-wide convention called by leading Southern Baptists of the day. The delegates of that convention, comprised mostly of well-to-do slaveowners and thus representing only a small slice of Southern Baptists at large, voted to establish the new Baptist convention in order to protect their own financial interests: African slavery. The Baptist Foreign Mission board at that time, a joint effort between Baptists North and South, had recently refused to appoint slaveowners as missionaries. The rejection, coming in the midst of an escalating war of words among Baptists over the nature of African slavery (a practice ordained of God according to Baptists of the South, but reprehensible and sinful in the estimation of many Baptists of the North) was the last straw. New Year’s Day was quietly, but pleasantly, observed in this city. There were no public demonstrations, but several social parties were given, both on New Year’s Eve and New Year’s Night. On New Year’s Eve, a ball was given at Spaeth’s Saloon, for the benefit of the furloughed soldiers of the Washington Artillery, now in this city. It was a very pleasant assembly, we understand, and passed off satisfactorily to all present. At Concert Hall, at Tableaux Exhibition was given by the young ladies of Miss Sedgwick’s School. It was well attended, and the performances were well received. In the afternoon, the children of the Baptist Sunday Schools enjoyed a very pleasant collation [meal] at Clara’s Hall, at which a number of invited guests also participated. Very few stores were closed, and business was not generally suspended. 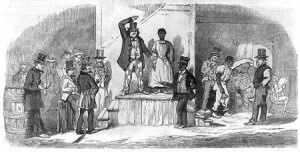 The annual hiring of negroes, took place at the Lower Market, and good prices were generally obtained. And so the day has passed, quietly and pleasantly, as we have already observed, and, we are happy to say, without accident to life or limb, that we could hear of. To our readers, one and all, we wish many happy returns of this popular festival. While white Baptist children and their parents and friends enjoy a fancy noon meal, Africans young and old, some Baptist church members but none considered truly human, are auctioned off. The African slaves hired out for the year are fearful of what this year may bring. Their owners, having offered them for use in return for rent money, pocket goodly sums. The new, temporary, masters also hope to realize a profit by working the slaves hard, feeding them as little as possible, clothing them cheaply and coarsely, and providing them with minimal medical assistance. Some renters hire entire families, not because they have any qualms about breaking up slave families, but because their chattel will be less likely to run away. A few talented slaves fetch high prices because they have marketable skills that can be utilized in a trade. Some attractive slave women are hired not because of their ability to work in the fields or as a house servant, but in order to provide sexual favors for the men who hire them. In short, the annual slave auction of New Year’s day is the embodiment of the slave system which the Southern Baptist Convention was formed in defense of. Many white Southern Baptists believe that enslavement of African Americans for perpetuity is God’s will. On the other hand, if white Baptists of the South decades earlier had chosen to stand up and oppose slavery as did their northern brethren, they would likely have become outcasts in their own land, journeying down a path that would have led to scorn and disgrace rather than a trajectory of cultural acceptance and regional success. And yet, as the new year dawns, the cultural accommodation of Southern Baptists teeters on the brink of being their (temporary, as time will prove) downfall.